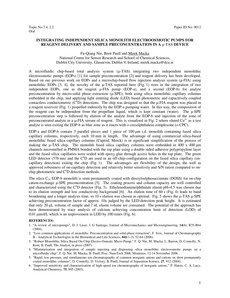 This microfluidic chip-based total analysis system (μ�TAS) for flow injection analysis (μ�FIA) integrates two independent monolithic electroosmotic pumps (EOPs), one of which also works as a column for on-chip micro-solid phase extraction (μ�SPE) preconcentration. 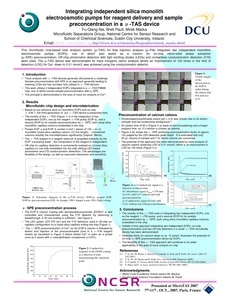 Off-chip photometric detection with light emitting diodes (LEDs) and contactless conductometric detection (C4D) were used. The μ�TAS device was demonstrated for trace inorganic cation analysis where an improvement of 100 times in the limit of detection (LOD) for Ca2+ down to 0.01 mmol/L was achieved using the conductometric detector.